climbing trip reports from the uk.rec.climbing newsgroup and subsequent messages, hosted on our own server. There's a plain vanilla listing of our older climbing report pages (some of which duplicate those below) here. Stanage North End 27. May 2012 - click for some pictures of our URC Quadrathon. North face from the start of the normal route. This can be an easy day trip, but there is still objective danger from crevasses, and the temptation to bag it without proper preparation or acclimatization makes it particularly risky. 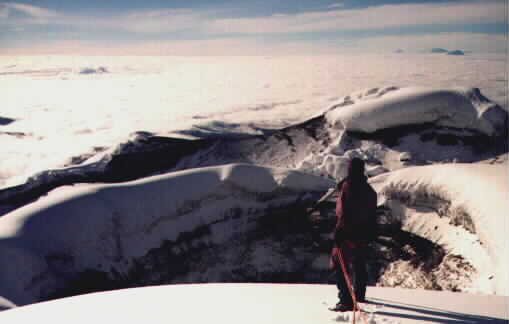 Judy at the summit crater of Cotopaxi. Among the highest active volcanoes in the world, and lying just 75 km south of the equator, Cotopaxi is a popular introduction to the South-American scale. 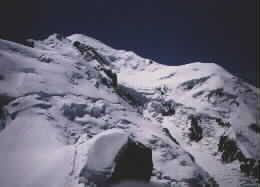 Generally easy, considering the altitude, but the route can vary as crevasses change. 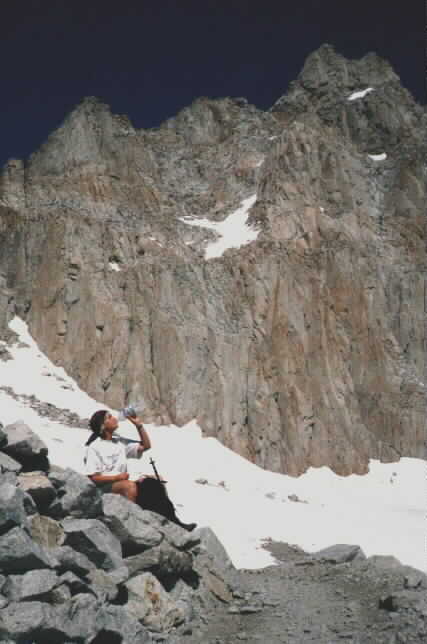 Thorough acclimatization is essential for a safe ascent. 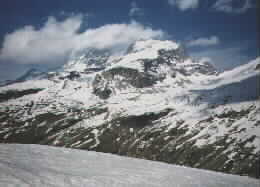 The Gran Paradiso, our first 4000'er, seen from the West. The highest mountain entirely within Italy is very popular, and its principal hut, the superb Vittorio Emanuele II, should be booked well in advance. The ascent involves 2,100 metres of climbing from the valley at Pont. 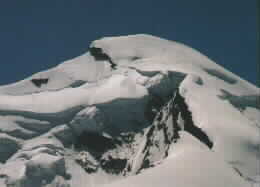 View of the summit ridge from Aiguille du Midi. Although popular, a total effort of 2,550m above Nid d'Aigle (2386m), and a very exposed summit climb of 1,050m from the Aiguille du Go�ter refuge (3817m), mean that the highest mountain in the Alps should never be underestimated. 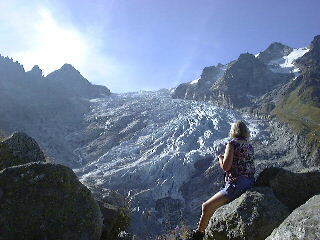 The Tour of Mont Blanc, or TMB, is a 200 km (120 miles) hike around the Mont Blanc massif in the European Alps. The route crosses several high passes and takes the traveller through spectacular mountain scenery in France, Italy and Switzerland. Our report from our first TMB in 1992 is also on-line. The Walkers' Haute Route is a 170 km (110 miles) mountain hike from Chamonix to Zermatt in the European Alps. 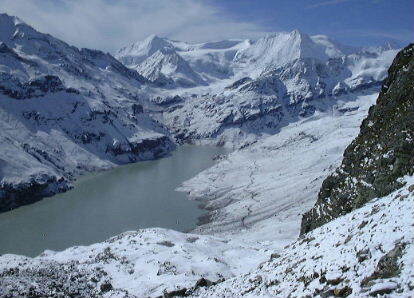 The rather arduous route crosses several high passes, and takes the traveller through spectacular, if desolate, mountain scenery in France and Switzerland. Atrocious conditions forced us to abandon this year's attempt. As the highest mountain in the contiguous 48 US States, Mount Whitney is getting crowded, and permits are now required even for day ascents. The route is generally easy, but there is little water available, and the height gain of 2,100 metres over a distance of some 19 km each way makes for a long day. 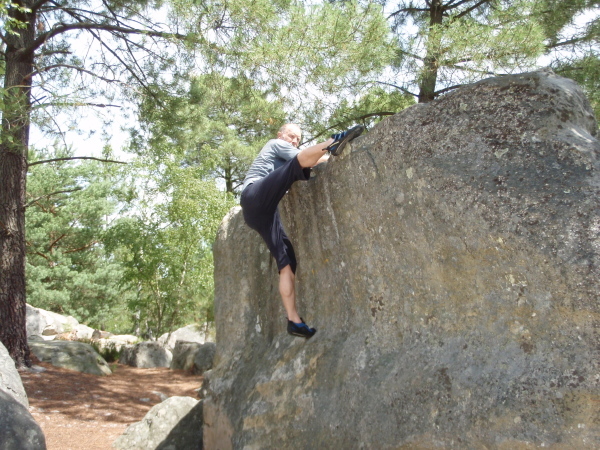 * "Youarsey" is the scatalogical homonym for the uk.rec.climbing user group on the Internet. Windgather Rocks 29. October 2018 - pictures of our chilly outing. Maeshafn 5. July 2017 - pictures of our URC Triathon. Stanage North End 27. May 2012 - pictures of our URC Quadrathon. Stanage Popular End 28. July 2011 - pictures of our URC Triothon. 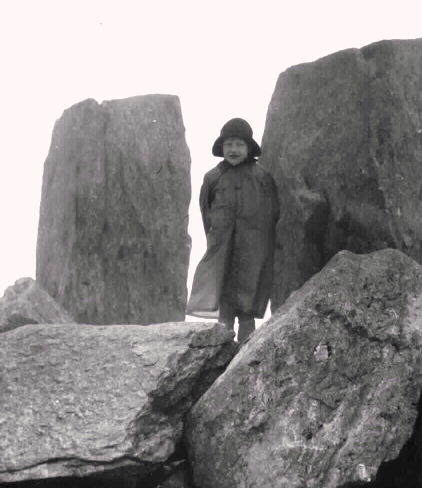 Carnedd Y Filiast 5. September 2010 - pictures of our URC Solothon. Frogsmouth Bolting Party 18. July 2010 - click for some pictures.